I have been to lots of horsey towns, especially with all our road trips. Ocala and Aiken are big ones. But none can hold a candle to Middleburg. One of the captivating parts of Middleburg, VA is that it seems like down every garden path or through any iron gate is a magical adventure just waiting for you. 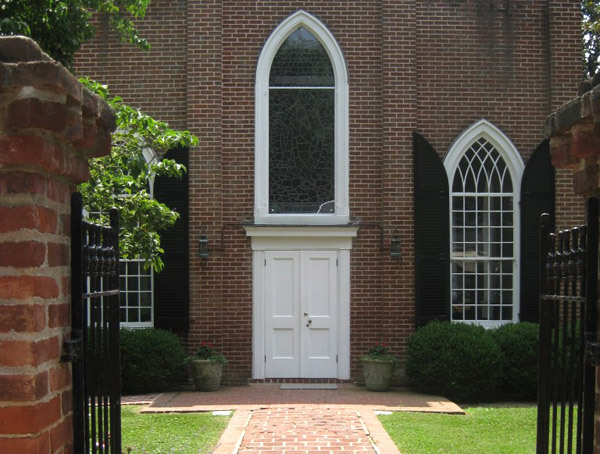 The sweet gate to the Emmanuel Episcopal church was no different. And you’re just as likely to stumble upon a bake sale with lemonade and cupcakes right in the heat of the day when it’s most needed. Lily and Robin volunteer at Golden Dreams Therapeutic Riding and braved the sun to sell delicious lemonade and cupcakes (a stellar combination) that saved my day. Another iconic part of Middleburg is The Chronicle of the Horse. Their office is as beautiful and as graceful as you would hope. They’re next door to the National Sporting Library which, I must regretfully tell you, I have never had the opportunity to visit. But don’t worry. I’m already working on the “To Be Continued” version of the Middleburg road trip and the Sporting Library is on the list. This statue stands between the two buildings and it moves me every time I see it. Even a photo, which doesn’t always capture the emotion of a moment (okay, I mean my photos), still conveys the aching beauty. It commemorates the one and a half million horses and mules that lost their lives in the Civil War as well as the fighting that took place near that spot at the Battle of Middleburg on June 19th, 1863. Another Middleburg favorite is the darling shop signs straight out of a story book. If you’re in town for a night or more you might want to think about staying at The Red Fox Inn. No trip is complete without a stop at Scruffy’s Ice Cream Parlor. While you choose which kind of ice cream you want you can browse the photos and listings of dogs and cats (and often horses, goats, and more) who need a home. Be careful, you may leave with a mint-chocolate-chip cone and a buoyant beagle. I love the name of this book store. “Books & Crannies”. How sweet and clever. I can spend hours in a book store, especially one as charming as this one. They say the Hidden Horse Tavern hid horses during the Civil War. I believe it. When you turn down this narrow street you might feel like you’re off on another magical adventure. Yes, if I put on Dorothy’s ruby slipper’s and clicked my heels together and whispered “There’s no place like home” I’d end up in Middleburg, Virginia. It will always be home in my heart. Loved your commentary and totally agree. I live just a few miles north of Middleburg and pinch myself everyday that I am fortunate to live in this area. It truly is magical. Now I really want to visit Middleburg again! We went to the Hunt Races years ago and I’ve always wanted to go back and spend some time. Jan, darling, I finally got my mouse working. I loved this journey to Middleburg. What a beautiful place and how well you showed all its charm. I don’t know if you will get this at this late date (I’ll also try an email) but expect a package for Suzie with a letter for you on Thursday, the 29th or Friday. My birthday card on the web was beautiful and Suzie’s greeting much appreciated!